So, I actually know what you mean about feeling alive while studying. Sometimes I miss the college days! ... I'm kind of a freak! haha. Weren't these questions great? I really liked all of them and had a hard time narrowing it down to only 13! Thanks for linking up! These were really good questions... I was going to do all 25 at first, but I liked your idea of narrowing it down. Thanks for hosting the link-up, and happy new year! Congrats on applying to med school! That's a huge step and I hope it works out for you. I completely agree about being intentional when you are married and spending time together. It's easy to be multi-tasking but so not worth it in the end. Why do we do that??? Thanks for linking up and for sharing your story. Thanks! It's exciting and terrifying all at the same time (like most big life decisions tend to be, I guess, haha). I think I try to multitask all the time because I feel like I have to be productive and doing things... but nothing extra really ever gets done because I'm not focused! 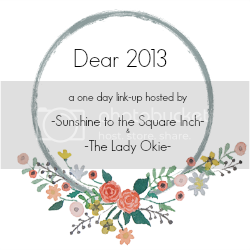 Thanks for stopping by and hosting the link-up!